Protect your critical documentation transparently for users and without depending on them. SealPath enables automatic protection of documents that are moved or copied to certain folders in a file server. This function is transparent to end users and enables you to force the protection of documents stored in Windows, NAS and other file servers. Users work with their shared folders as usual with the difference that now, if they extract files from the protected folders, these files will travel with SealPath protection wherever they go. Thousands of companies worldwide store their most important documentation and collaborate by using Office 365, Microsoft SharePoint and OneDrive. Once they have shared a folder or an external collaborator has downloaded a document, the company loses control of it. 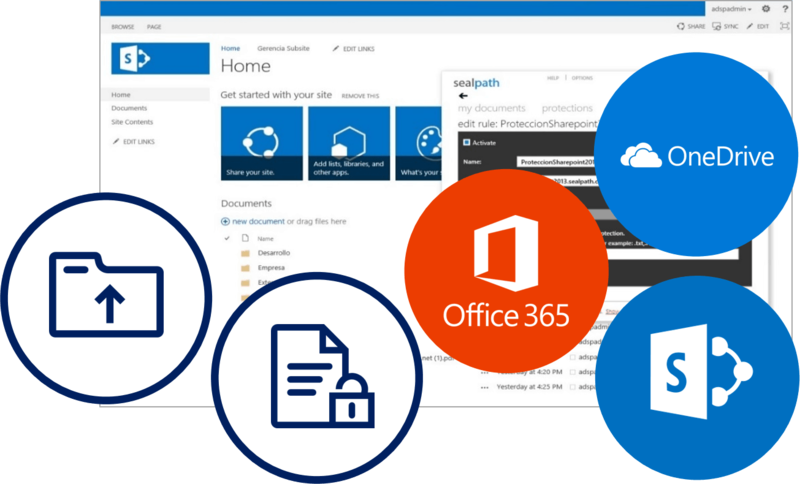 With SealPath you can automatically secure the documentation stored on SharePoint or OneDrive without requiring user intervention. It is not necessary to trust the user to perform manual protection. Thus when users download the documentation from a certain library it travels with SealPath protection and you can control who opens it and when or revoke the permission remotely. Google G-Suite enables companies to collaborate conveniently without needing to manage internal infrastructures or servers. Thanks to G-Suite’s cloud computing capability, users conveniently manage their email, schedule and documents in the cloud from the browser and administrators have tools to manage privacy and control access to corporate data in the G-Suite environment. However, once your documents leave this environment and are downloaded from Drive, sent by email, etc. the users and the administrators themselves lose control of them. SealPath can be used to automatically protect the content that you upload to Google Drive, adding a protection layer to documents that enables you to send them encrypted and restrict the right of use over the same. SealPath removes the need to trust users to manually protect the information before uploading to Drive. 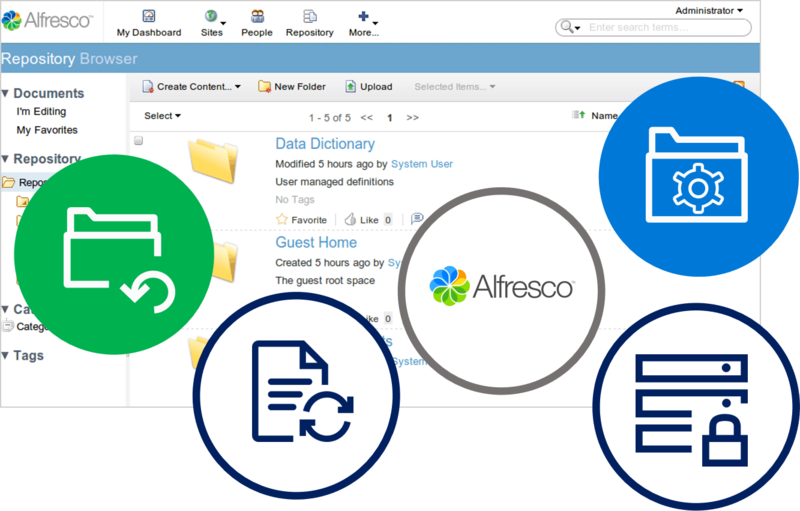 With Alfreco and other document managers you can set up document access permission but only while the documents are stored in the document manager. Once they are downloaded you can no longer control who accesses the documents and what can be done with them. These documents can also be shared with collaborators and external users and in this case the risk of information leaks is even greater. SealPath ensures that documents stored in a document manager are automatically protected with granular authorisations, thus restricting what can be done with them (read only, edit, copy and paste, etc.). These authorisations accompany the document wherever it travels and the owner can change who can access it and with what permission in real time, even when the documents are outside the document manager. This enables you to keep control of the documentation both within your perimeter or outside your network. Compliance with regulations is easier since accesses to the documents are audited regardless of where the document happens to be. Box, Dropbox and other EFSS (enterprise file sync and share) applications make sharing documents with external collaborators extremely easy. However, this easy sharing increases the risk of sensitive information leaks under certain circumstances. Users sometimes send a simple link to their collaborators to enable them to download documentation and this link can end up in the wrong hands. In the best case, you can control who accesses a document while it is in the cloud, but not when it has been downloaded. SealPath automates the protection of documents in Box, Dropbox and others EFSS systems transparently for users. The documents are encrypted and maintain the access permissions both inside and outside the EFFS even when they have been downloaded. You will have control over the documents and access audits in real time. SealPath enables you to protect emails and attachments with a single click. All users have to do is to click on the Secure email and/or attachments button in Outlook to restrict access to their emails. It’s as simple as sending an email. You can protect for the addressees of the email or by using a specific protection policy/classification. 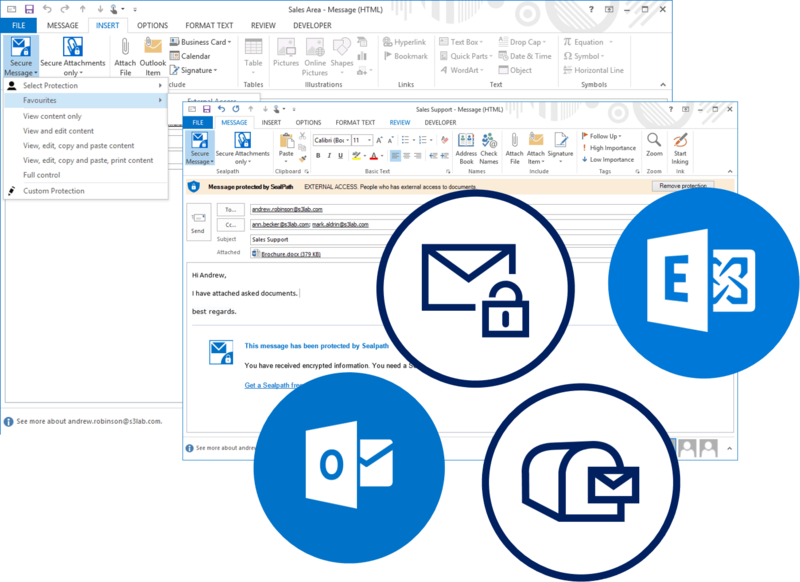 The administrator can force the emails of specific users to be protected when sent by Outlook by using a specific protection policy so that they are encrypted and kept under control. Protection can also be enabled automatically from Microsoft Exchange. You can set DLP rules so that all emails sent to certain domains or addressees and those received from specific senders are protected. You can also set up protection rules so that the content of the body of the email and its attachments are protected (if credit card numbers, information of a personal nature, specific patterns, particular words etc. are detected).